- but I'm pretty stoked about the answers to the mystery of the cans....They are back in the oven and I'm loading the car. As you would say, I luff this shot, presumably you and Youngest? Hmmm. This raises the possibility that the cans were originally put into the oven by a renter in, say, early May, 1973, and every renter since has either not discovered them or, like you, replaced them when they left. Awesome photo. I must copy! That really is a spectacular photo. It says love and LEGS. 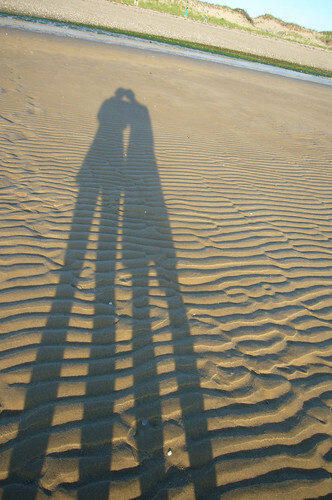 ...That time in the day when shadows grow long... Absolutely lovely- mat and frame that print it is priceless! You take the BEST pix!